Know at a glance how hard the wind is blowing! A spinning cupwheel mounted on your rooftop or boat mast uses free wind energy to instantly register every gust of wind in real time. The decorative and elegant spun silver face of the highly polished brass dial accurately displays the wind speed from 0 - 100 mph (0 - 160 kph). 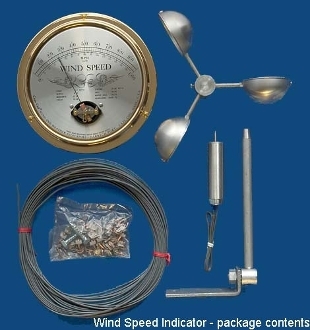 The rugged rooftop transmitter is constructed of a marine-alloy of aluminum for many years of trouble-free operation. Watch as a storm passes by – it's fun and entertaining for the whole family!